Space Very Long Baseline Interferometry (SVLBI) is primarily a radio astronomical technique, which extends conventional VLBI baselines into the space. Its potential applications in Global Geodesy include interconnection of celestial and terrestrial reference frames, and orbit determination using the delay and delay rate observables. In the past two decades, there have been significant theoretical developments in this field. With the launch of the first SVLBI satellite of the VLBI Space Observatory Programme (VSOP), Japan, this technique has now been realized. 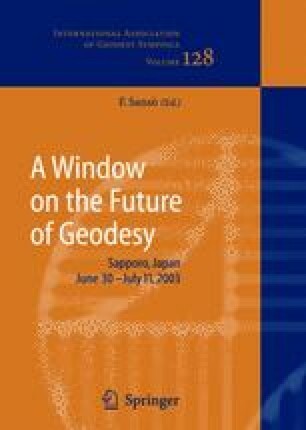 The Geodesy Demonstration Experiment (GEDEX) is designed to explore the feasibility of the geodetic applications of SVLBI. In this paper, some results of the numerical simulations for geodetic parameter estimation from VSOP data are presented. With the availability of real data from VSOP, it is necessary to repeat the precision analysis carried out earlier, in order to re-estimate the precision under realistic conditions. Numerical simulations for this purpose have been initiated, and the first results are presented in this paper. Conclusions are drawn, based upon the results obtained, and the implications for possible dedicated geodetic SVLBI missions in the future are discussed.